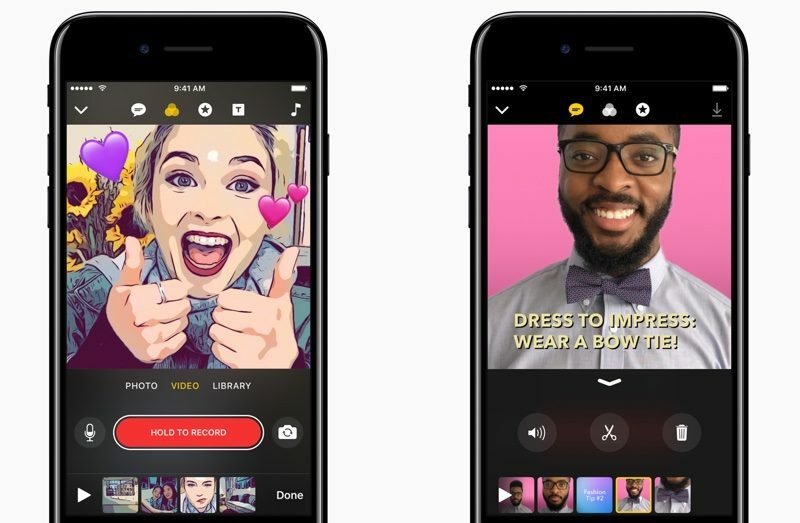 Apple today announced that its social video creation app "Clips," announced last month, will be available on the App Store for iPhone and iPad around 10:00 a.m. Pacific Time today, as reported by Engadget. Clips lets users combine videos, images, and music into one seamless video that can then be shared through iMessage, Facebook, Instagram, YouTube, and elsewhere. Users can also create animated captions called "Live Titles" using only their voice, and apply effects such as comic book filters, speech bubbles, and shapes. As noted by The Verge, clips have a familiar square format popularized by Instagram. Individual video clips up to 30 minutes in length can be combined to create up to an hour-long video shareable in 1080p HD. Update: Clips is now available on the App Store [Direct Link] for both iPhone and iPad, but propagation issues may be temporarily causing the app to be listed as only available for iPad. Some users might have to try again later. It will never live up to Ping. Every time I see that darned 'sticker' commercial from apple, I cringe. Ah, I see years of smartphone camera advancements finally reach the epitome with squared videos. Hey, they've been busy building a campus that is a monument to themselves. They haven't had time to work on designing computers. Hardware takes time ... which is why we have been given such revolutionary life changing products as emojis, stickers, and now cartoon filters.